At the age of three I helped my mom take care of sweet peas. I had my first garden when I was twelve, with instruction from the noted organic gardener, William Palm. He explained how to turn under the weeds to feed the earthworms and micro life. In 1976, I cleaned fifty pounds of Tahitian squash seeds and sent them to England, where Thompson & Morgan Seed Co. introduced Tahitian squash to the world. It was a joyful moment! My partner had collected the original seeds from Bora Bora. 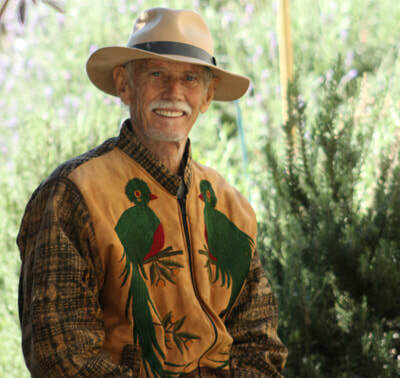 ​A few years later, I had the good fortune to study with Gordon Baker Lloyd, Master Gardener of Hearst Castle. He shared the secret to growing beautiful blooms: pigeon manure tea, which works well for most edibles that flower, like squash, beans, tomatoes, peppers, peas, strawberries, and peaches. I support this richly diverse and beautiful garden because it holds me and the whole city in the unconditional loving arms of Mother Nature." My radio program, Gardening Naturally, began on KCRW-FM in April of 1980. That summer, I was introduced to Bill Mollison, the founder of Permaculture, and received a month-long immersion course. Bill and I hosted a question and answer show on KCRW, talking about harvesting and storing rainwater. A few weeks later, I was part of a swale-building workshop on a steep slope with Bill and other friends. In 1987, I moved onto a large property in Sun Valley, California, where I embarked on a Permaculture learning voyage, creating many innovative projects inspired by Bill Mollison. The Permaculture master always said that observation was the key to creating harmony in the earth. My hollyhocks attracted goldfinches and saris of every color and hue, worn by Indian women, who stopped and stared at the flowers that took over half of the unpaved street. Pasadena is a city that cries for more of nature’s abundance. The Learning Garden demonstrates our love for the earth that sustains us. I support this richly diverse and beautiful garden because it holds me and the whole city in the unconditional loving arms of Mother Nature. I plan to share my gardening wisdom in a book about Permaculture and my many botanical explorations. Stay tuned!